Please be aware that the Southmead Road entrance to the hospital will be closed to all vehicles, starting Saturday 6 April. This will also affect patients of the Southmead NHS Blood Donor Centre. Diversion signs will be in place on several routes leading to the hospital. Pedestrians will be able to continue to use this entrance. Drivers from the Filton roundabout should go along A38 Gloucester Road and use either the Monks Park Avenue entrance or Dorian Road entrance. Drivers approaching from Pen Park Road should use the Monks Park Avenue entrance. Drivers from the Henleaze and Westbury-on-Trym directions should consider going along Wellington Hill to Gloucester Road and using the Dorian Road entrance. Brunel building: 10am to 8pm with protected meal times from 12pm to 2pm. Some ward visiting times may slightly differ depending on the clinical condition of those particular patients. Intensive Care Unit & Acute Medical Unit operate a more flexible system. Maternity: Partner and own children 10am to 8pm. Other visitors: 2pm to 4.30pm and 6.30pm to 7.30pm 2 visitors plus partner at a time, only children over 13. Please be aware, it can take 15 minutes to walk the length of the Brunel building Atrium. There is a motorised buggy available which seats six. Take a virtual walk through the Atrium of the Brunel, see where you can check in for your outpatient appointment and find where the gates are located throughout the building. 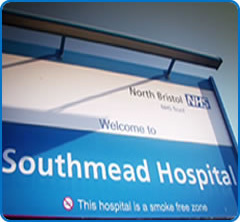 Southmead Hospital is served by over 12 bus services which stop either on site outside the main entrance to the Brunel building, or very close by, making it easier than ever to travel to and from Southmead by bus. Cycle parking is provided and detailed in the Southmead Hospital Bristol Site Map. You can plan your route on CycleStreets. Spare locks and emergency repair kits are available in the Security Travel and Parking office, Brunel building, Level 1. M4 junction 19 take the M32 towards Bristol. Leave the M32 at the first exit, (A4174 signposted Parkway). Proceed along the dual carriageway. At Filton Hill round about (junction with A38) go straight across onto B4056 Southmead Road. Go straight across the double mini roundabout. The hospital is 250 yards beyond the roundabout on left. At junction 17 leave motorway towards Bristol (W). Take fourth available exit off roundabout on to A4018 (Cribbs Causeway). Take second available exit off roundabout onto A4018 (Cribbs Causeway). Take first available exit off roundabout on to A4018. Take second available exit off roundabout on to A4018 (Passage Road). Take third available left on to Greystoke Avenue. Turn right at mini-roundabout on to Doncaster Road. Patient drop off bays are available inside the Brunel multi-storey car park and outside ED where you can park for up to 20 minutes free of charge. There is a patient waiting room located next to the drop off bays in the Burnel multi-storey. Monks Park car park is pay and display. Tyndalls Way temporary short stay overflow car park is pay by cash only. Parking charges apply 24 hours a day, 365 days a year. Disabled drivers displaying a blue badge can park free of charge. Disabled bays are provided in all public car parks. You will need to enter your vehicle registration and blue badge number. If there aren't any disabled bays available, you can park in a public car park space free of charge as long as you display your blue badge. Motorcycle parking is free of charge and parking areas are outlined on the Southmead Hospital Bristol Site Map. Parking on double yellow lines is forbidden, including blue badge holders. The Beaufort Way car park is barrier controlled as it is staff only. All women in active labour at the Mendip Birth Centre or the Central Delivery Suite (CDDS) and their partners, can benefit from free parking. Ask your midwife for details. For long term parking options or if you are having difficulty parking, particularly in an emergency, please telephone the Parking team on 0117 4143334, who will try and assist you. Please respect the local neighbours’ by not parking in adjacent streets. Be aware that there are parking restrictions on many of these roads with parking limited to residential permit holders only, Monday to Friday, 9am-4pm.